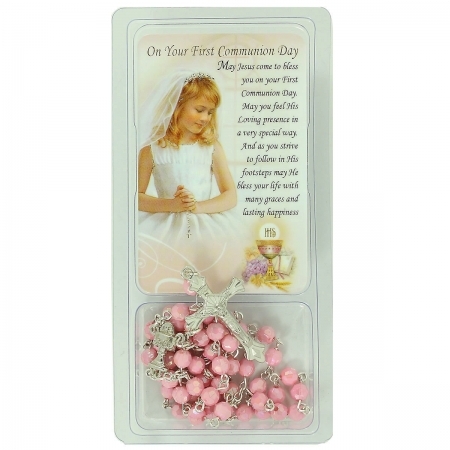 A simple but beautiful First Holy Communion gift comprises a token card and a pink rosary presented in a clear transparent plastic case. The size of the card is 82mm x 52mm (about the size of a credit card). 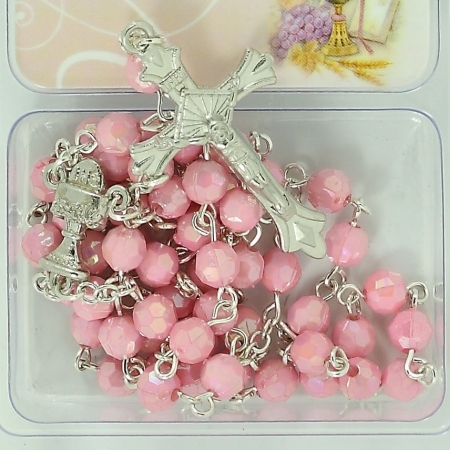 The beautiful pink rosary is sized for a small hand (7-12 years old). The beads are a little bit sparkling. The front of the card said "On Your First Communion Day: May Jesus come to bless you on your First Communion Day. May you feel His Loving presence in a very special way. And as you strive to follow His footsteps may He bless your life with many graces and lasting happiness." The back of the card said "Love makes our friend a little dearer. Joy makes our hearts a little lighter. Faith makes our path a little clearer. Hope makes our lives a little brighter. Peace brings us all a little nearer." In stock. Available for viewing/buying from our Communion Shop on the high street of Ashford Middlesex.